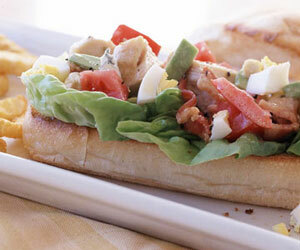 We used the classic cobb salad ingredients to make this hearty dinner sandwich. For dressing, in a small bowl whisk together the olive oil, vinegar, mustard, salt, and pepper. Stir in avocado; set aside. In a medium bowl combine the chicken, tomatoes, bacon, and blue cheese. Pour dressing mixture over chicken mixture and toss to coat. Place lettuce leaves on the bottom halves of the hollowed-out hoagie buns. Spoon chicken mixture atop. Sprinkle with chopped eggs. Top with bun halves. Makes 4 sandwiches.